.. Nichos are small shrines which can be designated to any cause. They can sit on a shelf or hang on a wall. They are very unique. 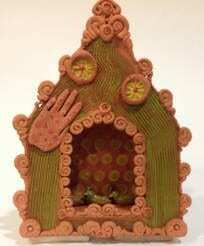 we will be working with earthenware clay and velvet underglazes. We have a variety of exceptional press molds which can be utilized to make leaf shapes, fish, animals, and day of the dead forms. Textures will be employed. Templates for the shape of the shrines will be provided. They are small and about 6″-9″ high/ 2-3″ deep and wide as works with the design. You are welcome to bring your own templates in this size range or your own images. This is a really fun project. Please do join us.